Need some inspiration? Two of my favorite hoopers break it down…thanks Christy and Tiana! Christabel Zamor, HoopGirl founder, shot this commercial in South Africa with Heart FM, a radio station based in London, in support of their “feel good” ad campaign. 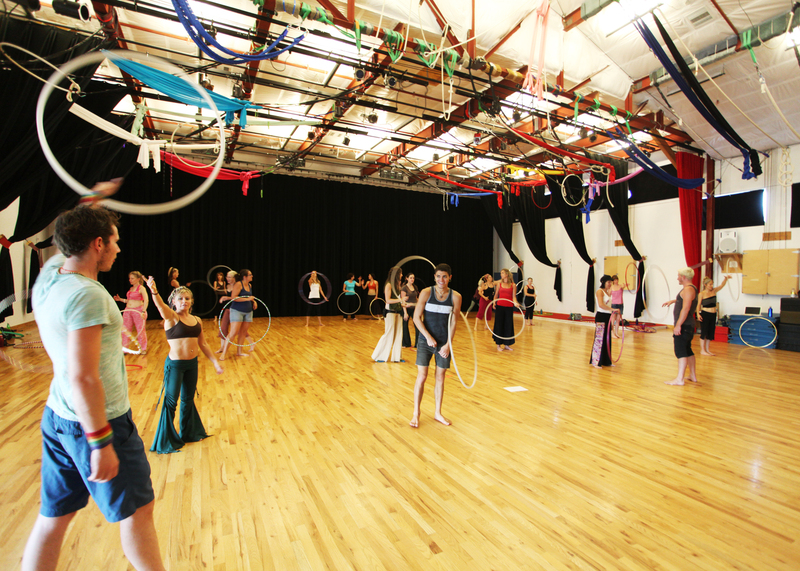 I first met Nick at the Hoop Technique workshop in Boulder, and I was immediately drawn to his style of hooping. He has amazing flow…you would never guess he’s only been hooping since January! It was great to catch up to him at Hoopcamp again…here are a few videos I took of him while we were there. Enjoy! 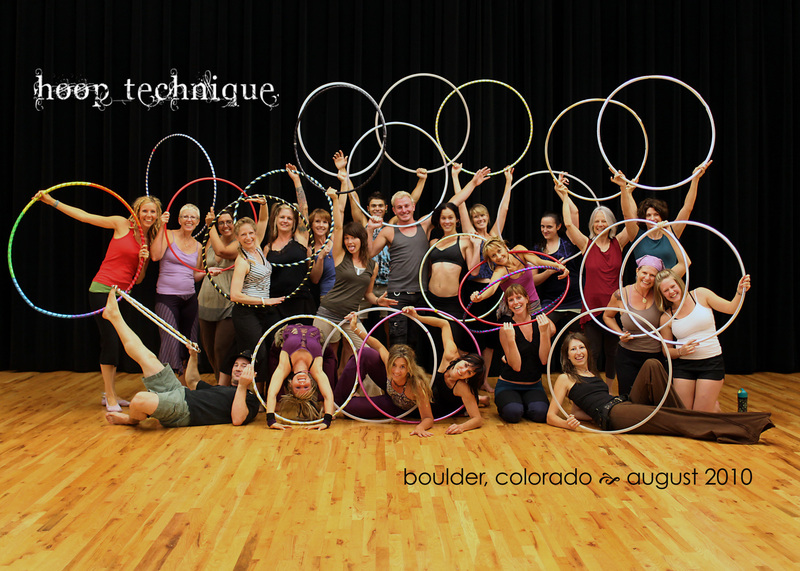 While perusing Hoop City a few weeks back, I came across a post by Danielle that talked about the upcoming Hoop Technique workshop in Boulder. Being that we were in Golden (just 20 minutes away), I practically shouted “HECK YES!!”. Sprial and Rich’s online videos have inspired me immensely in my hoop journey, and I knew I had to go. 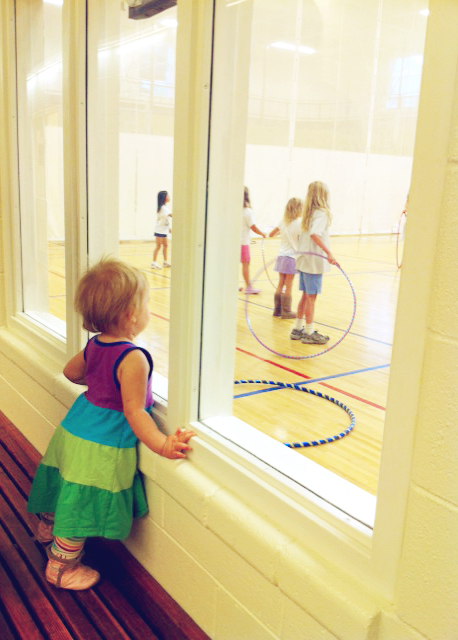 Matt and the girls dropped me off on Saturday at the Boulder Circus Center for the first day of my hoop bliss. The workshop started off with the typical circle up and name sharing. There was a diverse mix of hoopers, some who had just started hooping and some who had been hooping for many years. Two participants drove all the way from the Des Moines area (we have friends in common!) and another flew in from Atlanta. There were only about 25 hoopers, which made it a lot easier to connect with others and with Rich and Spiral. There were at least 4 participants who teach hoop dance or perform professional in some capacity (Rainbow Michael, Danielle Odette, Tammy Firefly, Ali Cerulli Avalon and up and coming hooper Nick Guzzardo)…so beyond just learning from Rich and Spiral, we could watch these more experienced hoopers tear it up and learn from them as well! The first day we focused a lot on isolations & isopops and learned more about space and energy. The second day was focused on time and flow, and we did a lot more “practicing”. 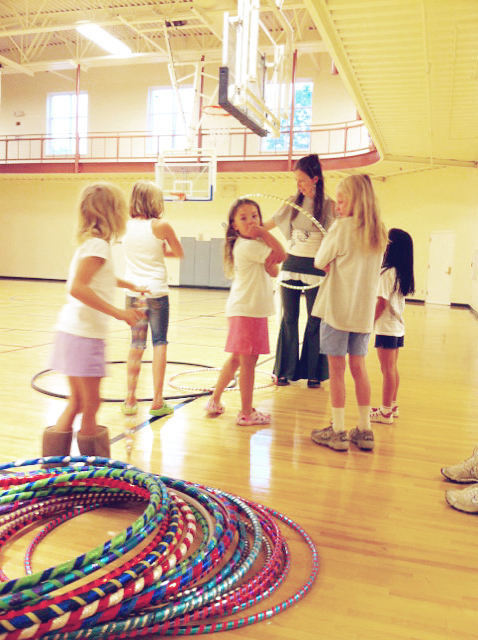 Hoop Technique Theory encompasses a broad range of hoop movement and vocabulary oriented around four key concepts: Space, Energy, Time and Flow. These four concepts provide a framework for creative expression and expansion. Through exercises, theory and instruction, our focus on these concepts will increase awareness of what’s possible and encourage exploration. Each concept can be applied to any move and can be understood as a lens through which it can be examined and experienced. 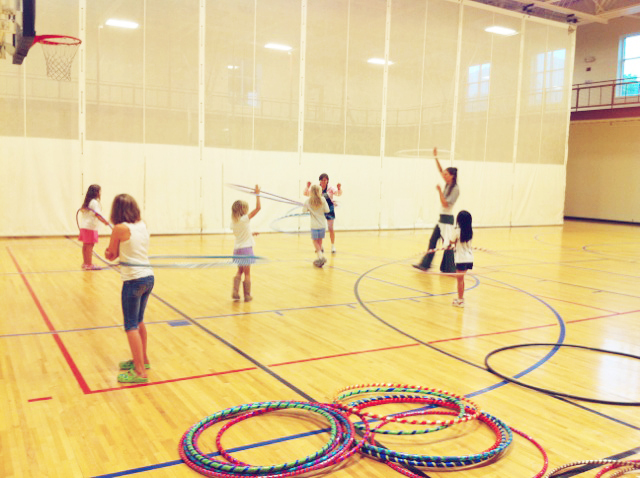 The concept of Space explores the relationship of body and hoop to the space we occupy while hooping. Energy refers to the physical and emotional energetic tones we can utilize to enrich and deepen the quality of our movement. Time relates to speed, acceleration, direction changes, rhythm, tempo and beat. Flow is the personal mastery of creative movement; effortless transition from move to move guided by expertise, muscle memory and inspiration. For us, flow unlocks the bliss and transcendent joy of hoop dance. Isolations, Extensions, Isopops, Isobreaks, Antispin, 3d Moves, Dynamic Stalls, Sustained Spinning, Variations of Reverses. 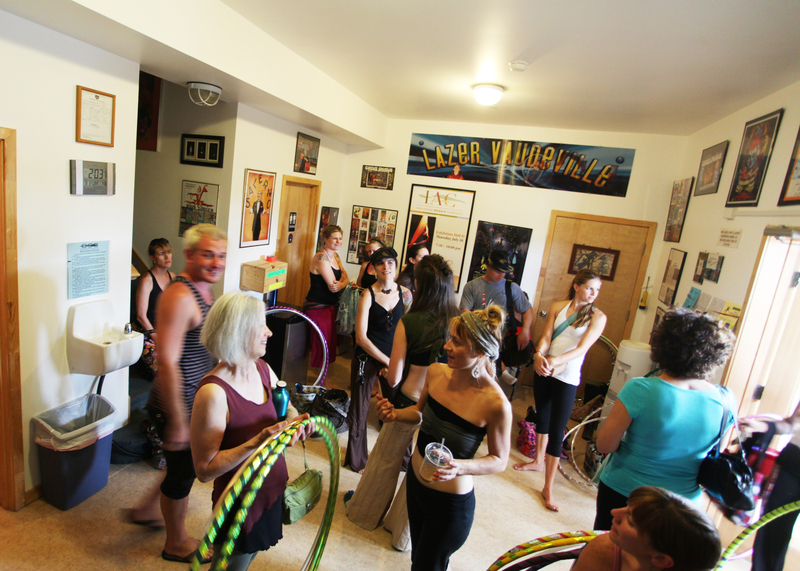 The workshop had a very holistic feel to it…with every possible aspect of hooping explained and unpacked. Rich, being an architect, has a very interesting way of seeing the hoop. In explaining his isopop theory, he got out his trusty whiteboard and drew out how the hoop would be moving and pinpointed the exact point on the hoop where the rotation would occur. It was EXTREMELY helpful and it clicked instantly in my head. I’m not saying I can isopop like Rich, but at least I understand how it works! I love his approach to hooping and the means by which he explains it. On his blog, he diagrams and tests different plastics for the most perfect hoop…which makes him the ultimate hoop geek. 🙂 Love it! I have to admit that before going to this workshop, I didn’t really have an interest in doing isolations and other non-core movements…but Rich changed all that! His style is so unique and clean…you can’t help but to be inspired. Spiral balances out Rich’s popping and isolating and lends a softer, more feminine touch on the hoop. 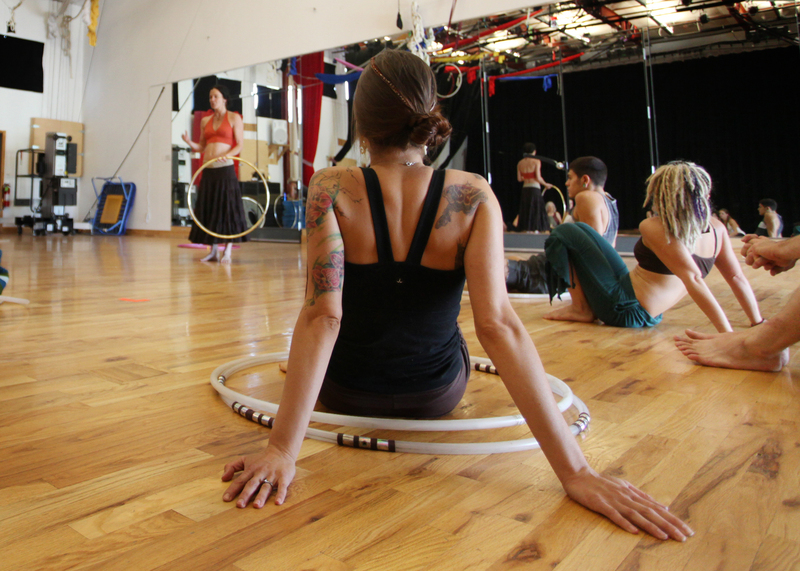 Much of her teaching at the workshop focused on sustained spinning and flow. Her teachings really helped me, because right now I’m still trying to figure out which movements combine well with others and flowing from one move to the next without thought. Spiral is a true artist in the hoop, always looking to take her practice to the next level. She has been hooping for 8 years and is a “pioneer” in the hoop world….always exploring and expanding her repertoire and passing her knowledge along to others. I was particularly interested in her time spent in “circus school” in Vermont and I enjoyed reading her online journal of her experiences there. She is an incredible performer and she takes her craft very seriously! I feel so blessed to have learned from her in person. The hoopers in Colorado are a delightful bunch of beautiful people and I am so happy to have had the opportunity to be a part of it…even if it was just for a few months. I also just can’t say enough about Rich and Spiral and the fantastic energy and enthusiasm they bring to the hooping community. They do have tour dates set for Canada: Vancouver on Sept. 25, Victoria Sept. 26, Hoop Camp in Santa Cruz the next weekend, and Montreal Oct. 9 & 10. There will be more in the U.S…but they are not scheduled yet. Be on the look out for their new DVD, which is scheduled to be released in late September! And now the countdown to HoopCamp begins…I can hardly wait!